Hi! I’m Mike Curato, and I am so excited to be a part of this author blog tour! First off, thanks to Fred Koehler for passing the baton to me. I met Fred an an SCBWI Winter Conference several years ago. We enjoyed some yummy Chinese food together and we’ve been Facebook author-illustrator compadres ever since. If you haven’t already picked up a copy of his debut book, How to Cheer Up Dad, then you’re in luck because it will make a great Father’s Day gift! 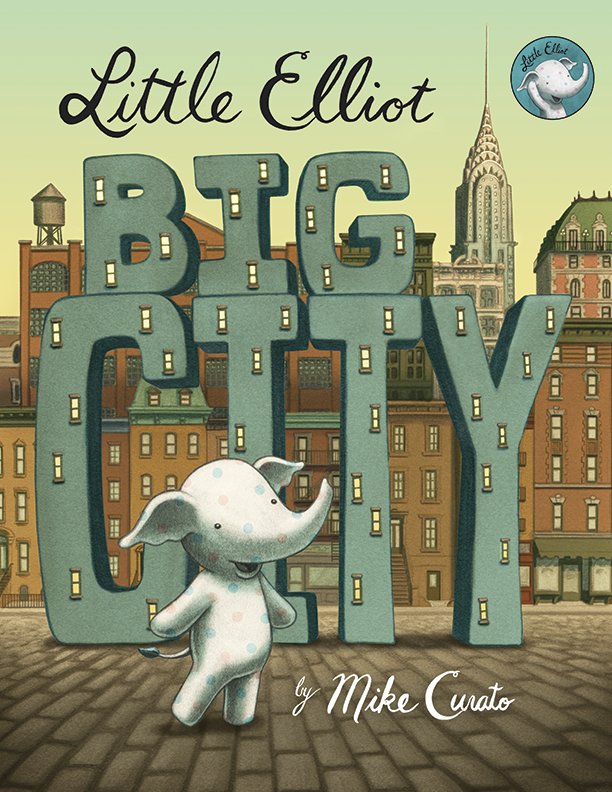 Well, I am busy promoting my upcoming debut title, Little Elliot Big City, and in the process of finishing up my second book in the series, Little Elliot, Big Family. The first book comes out on August 26th, and I can hardly wait! I just received my first hardcover copy, and it’s so magical having it in my hands. I keep knocking on the cover to make sure it’s real! 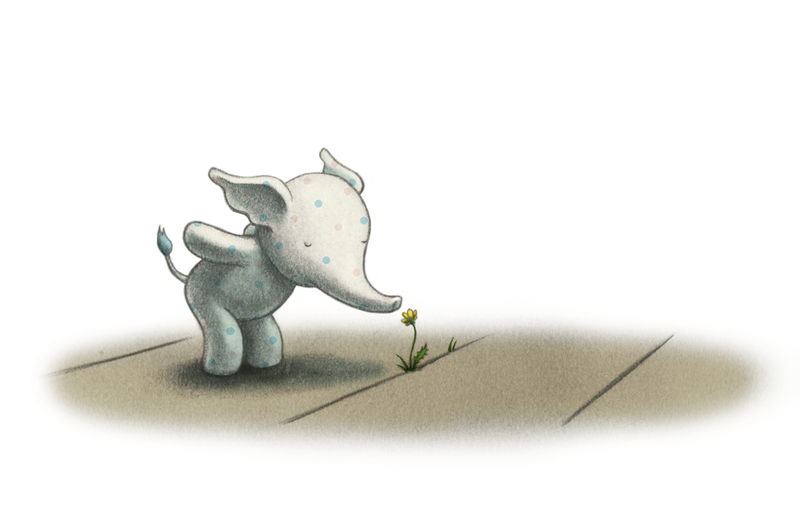 Little Elliot is a polka-dotted elephant living in NYC circa 1940. It’s hard being a little guy in such a big place, and I think that makes him really relatable for kids. A new friend comes along though, and life gets a lot happier, and maybe a little easier. Little Elliot will be printed in English, German, Hebrew, Mandarin, and Korean! Elliot has been a character that I’ve been developing for many years, and I’m so excited to be able to share him with the world. Well, that’s a difficult question, especially if we’re talking about children’s books as a whole genre! Perhaps I’ll limit that vast category down to contemporary works. There are many new character picture books, and there are many historical non-fiction picture books, and I think Little Elliot is rare in that it combines a new fictional character in a historical setting. 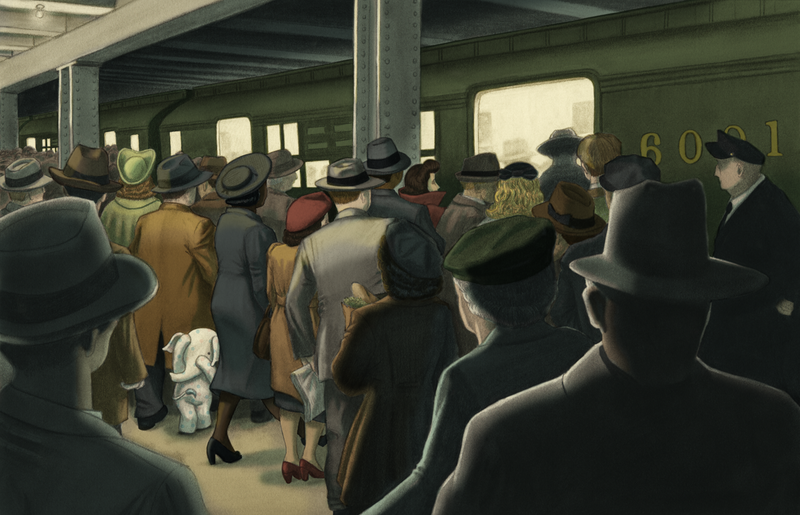 Also, while I’m sure people can see my influences, like Edward Hopper and Chris Van Allsburg, I would like to think that my style is unique. The Little Elliot series is very quiet and sweet. I love stories that tug at the heart strings. I really appreciate when a story can elicit empathy in people, and in the end, delivers a gentle and real reminder that everything will be ok. It’s so hard being little, and I am not just talking about children. It’s a great big world, and sometimes we can be overwhelmed by it, but somehow a little bit of love and the tiniest act of caring can pull us from the depths. My process has been a dance of images and text. I usually start with some images and a feeling that I want to evoke. The text develops when I look at the images and ask why? Why is Elliot feeling this way? What happened? Who can he turn to? How is this going to resolve itself? Etcetera, etcetera. 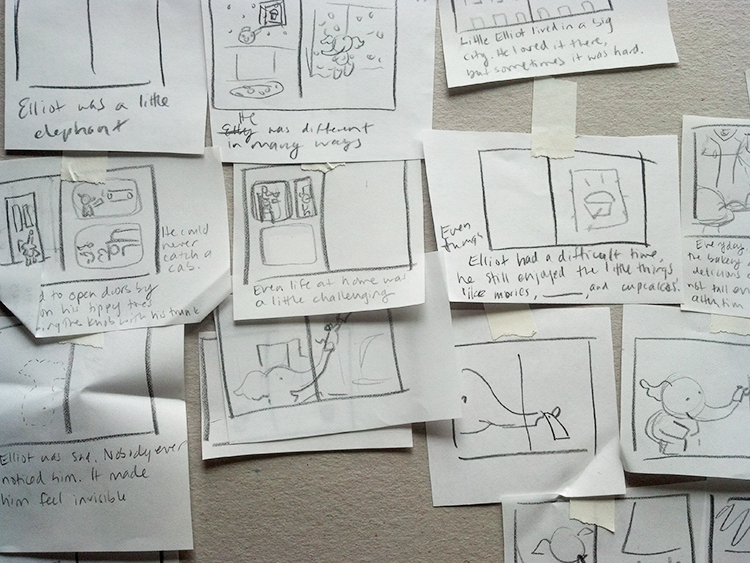 Once I am able to answer those questions, I go back to drawing and figuring out how to bridge the gaps visually. I’m very spare with my text in the end, but I usually start with more text than I need, then pare it down if/when the illustration is already communicating what the text is saying. is the author of numerous children’s books, including Martha Doesn’t Say Sorry! and Martha Doesn’t Share!. Her recent book Crankenstein, illustrated by Dan Santat, will make even the crankiest of readers smile. 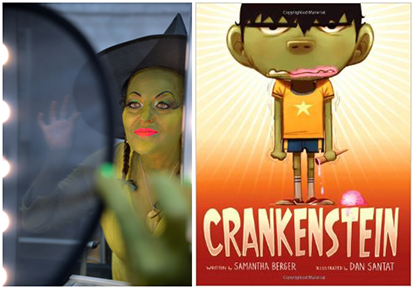 Crankenstein also won the SCBWI Crystal Kite Award for the New York area! I’m hoping she’ll tell us about her current book in the making, Witch Spa, illustrated by my buddy Isabel Roxas! Samantha is a class act, and you should go buy all of her books immediately! 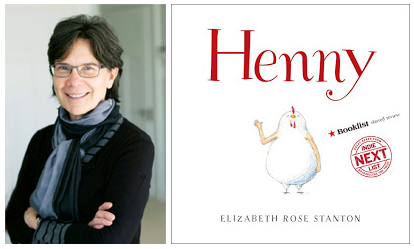 is a friend from my Seattle days, and author/illustrator of a dear new book named Henny, about a chicken who was born with arms instead of wings. It has been described as both “endearing” and “creepy-cute.” What else do you need to know to want to read this!? Also, I have a signed copy, so you should be jealous. 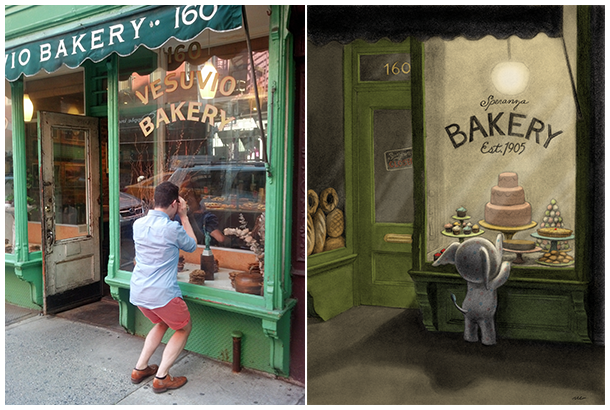 → Little Elliot Big City BOOK TRAILER! Very cool blog.i shall keep reading!